The 40 days to change complete! Yesterday was the final day of my self-created 40 days to change. It was magnificent because my biggest goal when I started this game was to find a home for my family and yesterday I signed the escrow papers for our new home! I didn’t even realize this fantastic gift until today when I looked at the calendar and found that, not only am I done with this challenge, I had finished with such a huge goal achieved. How did this challenge come about? I had gone to church one Sunday (we are irregular, unfortunately). Arjan, my eldest, had asked that we go to church. He said it was time to go back. Now, he’s 4 years old and when a 4-year-old tells you that it’s time to go to church…I’m thinking, especially now, that it’s God sending a message through a pure little spirit. I didn’t mess around. We went to one of the mega churches in Roseville. I did get a message, two actually, while there that day. One of them came in the form of a big banner that said “40 Days To Change Challenge!” I’m sure it was more about the Bible and knowing God, however, I decided to take it and apply it to myself and my home. I can’t remember the other message but this one pretty much changed my life so we will let the other go. What inspired this challenge? I had fallen into a sort of housewife blues. I was working like crazy on my writing career for over a year and my home and family life was way out of balance. I had also become depressed with house hunting and not having the funds, losing out on a couple homes, and just feeling hopeless. My home was a mess, the money was a mess, I was tired all the time, we were eating a lot of frozen foods and drive thru. My boys were watching way too much TV and I had stopped exercising completely. I had hit a wall with everything! I need to be snapped out of it and really motivated and inspired. The house hunting was really getting me down. We only had $30K in savings and, although it sounds good, it was pocket change when it comes to putting a down on a house these days. Then I started working with this great lender and she handed me the reality that we only qualified for a $130K loan. In today’s market where, even in Sacramento (once a very affordable area), homes are now starting at $350K to $500k. And that is for an average home. You can see where the depression started growing. We had worked so hard and went without for so many years preparing for this moment. The moment came and we were priced out of the market. I was finding homes alright, but in ghettos, and they were still above our price range. The Challenge. I refused to be a victim. One day I rose off that couch and looked about. I was truly disgusted. I began a new and better life right then and there for myself and my whole family right down to the dogs and Maggie, my beloved cat. I decided to start practicing what I preach. 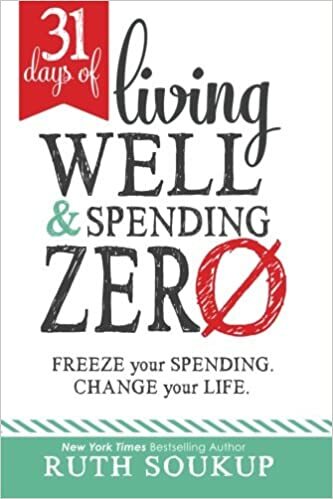 I write books about being frugal, homemaking, cooking from scratch, staying inspired. I had gotten off track but no more. I picked up the vacuum and my budgeting notebook, I turned off that TV and put the boys outside in the sandbox and sunshine, I brewed my coffee, put on my music and started making big plans. First, to get my house scrubbed and organized again. To get back to all my home cooking and up the vegetables and produce times three. To get back to exercising every day for an hour. To complete some of my unfinished novellas. To find a house we could afford. To understand the Bible and God a bit more. To have way more play and fun. To have way less TV and more outdoor time. To have less work and more family and friend time. To get our budget in order. To find a balance between work and home. What happened on the journey. My list was pretty simple. I got out the cleaning supplies, the budgeting notebook, the Bible. I started making schedules and plans, setting goals and cutting cost. What wound up happening was amazing. What was accomplished in the end went beyond my goals. Every day I would do a large and a small task and I would take the boys out to the park, an errand outside the house, or to the library. We started ordering tons of books from the library again. I didn’t take the boys out every single day, however, the days we didn’t go somewhere they would play out in our back yard all day. As long as they get dirty and soak up the sun and air, I’m happy. TV is minimal now. The house is filled with good music most of the day. The boys watch some educational PBS in the morning. I enjoy Joyce Meyer and Joel Osteen in the mornings with my coffee. I’ve taken a liking to Creflo Dollar lately also. As for the evenings, my husband’s diet of 2 hours of news has been reduced to half an hour and then we enjoy some comedy. We both really enjoy The Big Bang Theory lately. As for exercise, I got back onto my tread climber and almost daily I read, sweat, and put in an hour. I don’t work out every single day. We traveled a bit and I had appointments. But it was at least 4 to 6 days a week. I haven’t lost even an ounce but I do feel great. I feel energetic during the day and deliciously tired at night. My body feels good and strong and I’m much happier. Exercise will do that. Our diet is fabulous again. I am back to making everything from scratch, we eat tons of produce morning, noon, and night. We have had some drive thru (Taco Bell of course) and I have done some convenience food. I love Annie’s mac and cheese, however, we will have organic green beans, salad, and some chicken with that. We have a salad daily, twice a day at times and we have 1 to 5 vegetables with lunch and dinner. Breakfast has a lot of fruit. We snack on avocados, apples, carrots, mangos. We are down to eating one chicken a week and that is the only meat. We are maybe 60 percent vegetarian through the week. I don’t want to be vegetarian completely but I feel better eating a minimal amount. Our diet is tons of produce, yogurt, chicken, bread, brown rice, beans, eggs, potatoes, and coffee, of course. Everything listed is homemade. I find my cooking is getting much better, more flavorful lately. We are all feeling and looking good. What a difference healthy and homemade makes. I sat down and made out a monthly budget. I found the best way to get finances under control is to stop spending. I did not get this book but I did read this woman’s blog and I like her ideas. I was going to buy the book and then decided to save the coinage and start the NO spending. I usually do get books when I need inspiration but the books have to be through the library. Or I look up blogs of women that get me motivated. Anyway, the best way to get your money in order is to stop all spending. So, I pay the rent, the utilities, some gas and grocery money and that is it. I got the groceries down to around $400-$600 with all the cooking from scratch and not buying extras. No junk food, convenience food…nada. Then the tax refund came and I paid off all the little debts that just happen, the tread climber, my editor, my credit card (it was a secured card but the bank “rewarded” me by turning it into a regular credit card and kept increasing the limit until I called and ask them to stop). I paid it all off. Little debts and extra bills can really cause issues. They start to choke the budget as a little patch of weeds can get out of control in a garden very fast if not pulled and cleaned out. I then created a household savings account linked to the family checking account and put a $1,000 in that account. Our big savings in another bank altogether so we can’t touch it. I filled up Bali’s secured card. With the remaining money, I stocked up our kitchen pantry and bathroom toiletries cabinet. I used a small amount to buy gifts for friends and family and for us to have some fun at the thrift store. All my accounts are full now and we are very comfortable. Now, the house. We couldn’t afford a house in our area so I moved South. The town my husband works in is small, sweet, and affordable. Still, couldn’t afford it. Then I started studying foreclosures. The problem with foreclosures is that there is usually so much damage that it won’t qualify for a conventional or FHA loan. But HUD houses do! They are kept up to state standards of good repair and will qualify for all kinds of loans. I just happened to read about this and then low and behold…I drove past a HUD house for sale in a nice and tidy little neighborhood. It was $135K. Bingo. I put an offer on it and the bidding started. By midnight no one else had bid and we won. Long story short, we now own a little 1941 house that needs some work but has good bones. The closing cost was far lower than predicted and we will have enough to hire the carpenter, plumber, electrician, installation company, and buy all the supplies with money to spare. I continue to be as frugal as my great, great grandmother. I love having plenty of money in the bank and not sweat the bills. I have grown fond of this way of living and I now set aside some money monthly to do a little thrift store fun, go to the movies, or out to eat. I even do these things frugally as in dining at two for one deals or a buffet like the Golden Corral. Movies are something I brought back to my life after years of not going to a theater. I can get half off on the ticket and popcorn on Tuesdays with my new Regency card. I get free Starbucks cards through my bank when I use my credit card. Then I started working on my self-esteem. I feel pretty good but I’ve had a lifelong struggle with the weight. I don’t know if it will be leaving in this lifetime so I decided to look my best as is. I finally went clothes shopping at one of the best thrift stores where the wealthy dump their clothes. I created a new wardrobe that I love. I also purchased all kinds of new makeup (I’ve been wearing only mascara for years), hair dye, and I actually bought myself two new pairs of great Sketcher shoes! This is all big. I haven’t had new shoes in 8 years. I say no to thrift store shoes, I believe they cause body issues, back issues. Don’t do it. I also decided that from now on I purchase quality only. That goes for clothes, shoes, household items. I started by buying really great, high thread, long lasting sheets at this thrift store. I found Calvin Klien and Bed and Bath items. No more shabby things or cheap stuff that falls apart easily. If you really take the time you can get great pieces of furniture, sheets, and outfits at thrift stores. I shop in the towns were the wealthy bay area people live. The rich tire of their goods quickly. Last of all but the most important and the most unexpected part. I grew my relationship with God in an incredible way. It started with an advertisement to The Shack, then I saw a trailer for a movie called The Case for Christ. My interest was peaked. I ordered the book The Case for Christ and wound up with Lee Strobel’s book The Case for the Real Jesus. I’m sure now that God decided that I should start with that book. Why? Because I didn’t order that book from the library…at least I didn’t mean to. But that came and it led to me reading The Case for the Creator. I then took myself to the movies and watched The Shack and cried for two days. I knew that God was talking to me and it was an incredible feeling when the supernatural comes into your life. I have purchased The Everyday Life Bible with Joyce Meyers and I read it daily. I once upon a time looked on the Bible with suspicion and disdain. I find comfort in it now. I don’t understand it all and I never will. I’m ok with that now. I love connecting with God daily through the written Word. I am currently reading The Case for Christ and The Case for Faith by Lee Strobel. I have to say that I came into this riding the fence. I didn’t like the Bible, I was sure Jesus was just a prophet, and God was just this Universal energy to be bent with positive thoughts and the art of manifesting. Oh, how different my thinking is now. I have always had a love of Jesus and felt His presence in my life for the last decade, however, now that my eyes and heart are being opened in all matters and I continue my research and learning, my love and respect grows. I feel my relationship with God changing profoundly. I see myself and my life blossoming in all these miraculous ways, I feel so good, I feel protected, provided for, guided, and I feel an unseen presence taking root in my heart and my life. I laugh deeply and cry heartily almost daily and I love it! I may seem a bit unbalanced to the outsider’s observance but I feel more sane and happy than ever in my life. I have an anchor in the storm at last. I know where I belong. I have decided to turn my life completely to the Christian life without further question. And so, I have my mug of coffee in hand and I watch my Joel, Joyce, Creflo…whatever is on at that time. I read my big, pink bible and I continue on this fantastic journey. The books and my writing career…almost forgot. I accomplished a lot in this area as well. With the books that I’ve already published, I stopped being cheap but remained frugal. I used to do all my own editing, proofreading and I’d create book covers from Amazons free cover creator. I have been selling my books on a larger scale now and with that, I’ve also been receiving ratings and reviews. I’m pleased with all the reviews. Some are great and ego boosting and some provide much needed criticism which I then use to improve. One criticism I have been receiving is in regards to my proofreading and typos. So, I stopped being so very cheap and I hired a friend who does editing to proofread and edit all my books. I sent every book to her. Fortunately, she is kind and knows I’m still a struggling artist and is charging me a fraction of what she should be charging. I also found this great website that offers two for one ebook covers and if I do a coupon for $75 with the combined two for one I can get four book covers! Yay! Probably not yay for James, the cover maker, but it’s great for my wallet. I have put new and store bought covers on ALL my books and had them ALL edited. My sales have increased. It gives your books more of a reputable standing when they look polished and as though the author spent some time and money on them. I have also changed my blog. I was weary of putting real family photos up but I realized people want to connect to the blogger. I have changed my format and add a combination of personal photos and free photos off the internet. My traffic has doubled and my views quadrupled and beyond. It helps that I’m writing more from the heart than ever. I have not worked on my fiction books at all. I have one book half written and two books started. I cannot even begin to focus on writing at this time. That will be another challenge. The novella writing challenge! Challenges are what keep me motivated. I hope this blog has inspired and motivated some of you out there. Previous The Case for a Creator. Next The beginnings of bringing an old home back to life. Congratulations not only on your new home, but your incredible accomplishments as well! I can relate with you on so many levels! Your motivation is inspiring! Isn’t it fun! Well, we have to do it to keep moving forward so we might as well make it into a game right? Congratulations on your new home!!! When are you going to offer your 40 day to change workshop? 🙂 You are accomplishing so much. Thanks you for the inspiration. Hey, a workshop would be fun! BTW do you get my comments on your site? I leave them and I don’t know if your ‘like’ is for my stuff or yours. I have to check the settings, sometimes comments cue up on the admin page. Thanks for letting me know!!! !